Last Friday we spent the day at the Core-Mark Trade Show, which took place here, in Denver, CO, with our brokerage team Mountain Creek Marketing. Core-Mark is a company that distributes packaged consumer products to convenience stores, grocers, and specialty stores across the country. The theme was Western, so we donned our cowboy boots, handed out samples, ate too much fun food (gummy bears for lunch anyone?) and made some great connections. So hopefully this fall when you stop at the shop on the corner in your neighborhood for gas and coffee, you’ll be able to pick-up a Daffy Apple too! 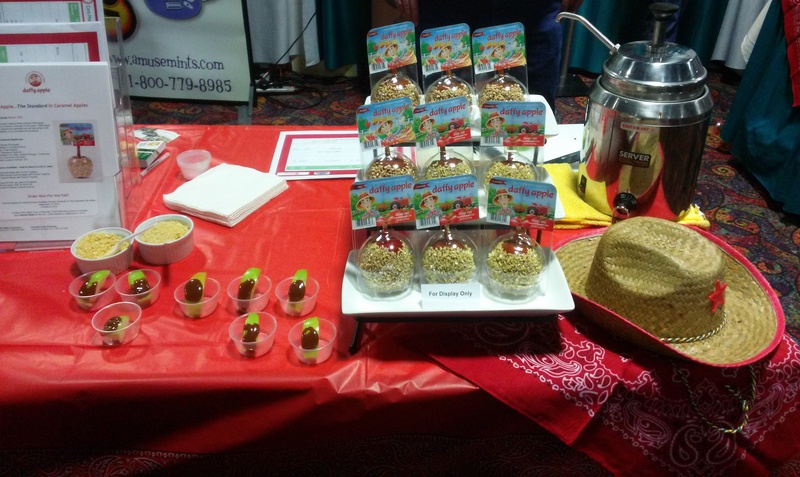 Posted in Daffy Farms, The Daffy Apple and tagged caramel apple, caramel apples, colorado, core-mark, daffy apple, daffy farms, fall, petite, trade show, traditional on March 10, 2014 by daffyfarmsblog.